Life in the secluded yet vibrant town of Santa Fe is mellow and serene. The warm, moist climate of the highlands and the mind-boggling biodiversity that envelopes this place are relaxing and exciting all at once. You’ll be charmed by how effortlessly kind and welcoming the locals are. Their timeless culture remains intact and they are happy to see new faces. A few dozen expats have made their homes here, from all over the globe. Some have built their dream retirement homes and others have created small businesses, from farming to freelancing via internet to hosting guests at a B&B. The town has many of the amenities you might desire without having a developed feel. You will find restaurants, bars, and shops here. Internet service is reliable. The city of Santiago is just an hour’s drive away if you need a trip to the metropolis, and you don’t even have to own a car. Buses run between Santa Fe and Santiago frequently, providing safe and affordable transportation. The fresh coffee is heavenly and the organic local produce will make you for a healthier lifestyle in Santa Fe. There are plenty of activities to pass the time: Meanders through the hills, by the rivers and waterfalls, nature-spotting trips to the Santa Fe National Park, white-water rafting, inner tubing, bird-watching, and visits to the coffee plantations and orchid gardens. 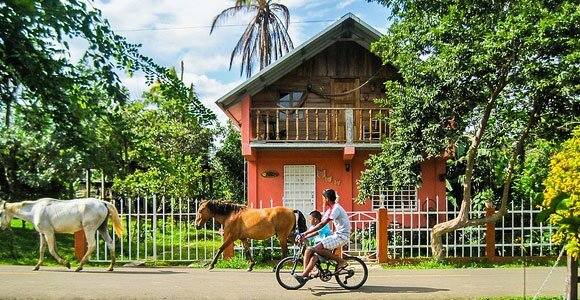 Find out more about Panama and other countries from around the world in IL’s free daily postcard e-letter. Sign up for these postcards by entering your email address in the box below and we’ll also send you a free report: Panama: First-World Convenience at Third-World Prices. We value your privacy. You can unsubscribe at any time.